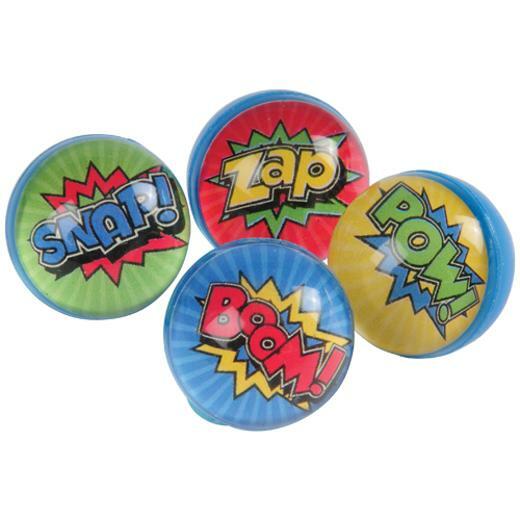 Cheap Superhero Bounce Balls - 12 Ct.
Superhero Tattoos - 144 Ct. They may not be able to leap tall buildings in a single bound, but these superhero-themed bounce balls do fly high! Inspired by the pop art pulled straight from the comics, each ball has a fun superhero action word such as "POW!" or "BOOM!". Children will enjoy tossing these toys around the backyard or "out-bouncing" their friends. A great party favor for any superhero-themed event. L: 5.7 in. W: 1.25 in. H: 6.4 in.